The Ohio Wesleyan Board of Trustees provides exemplary leadership and oversight of the mission and values of our University. Our board includes individuals who bring great experience in a variety of sectors. While most are alumni, the board also includes parents of current or recent students and community leaders with a passion for higher education. 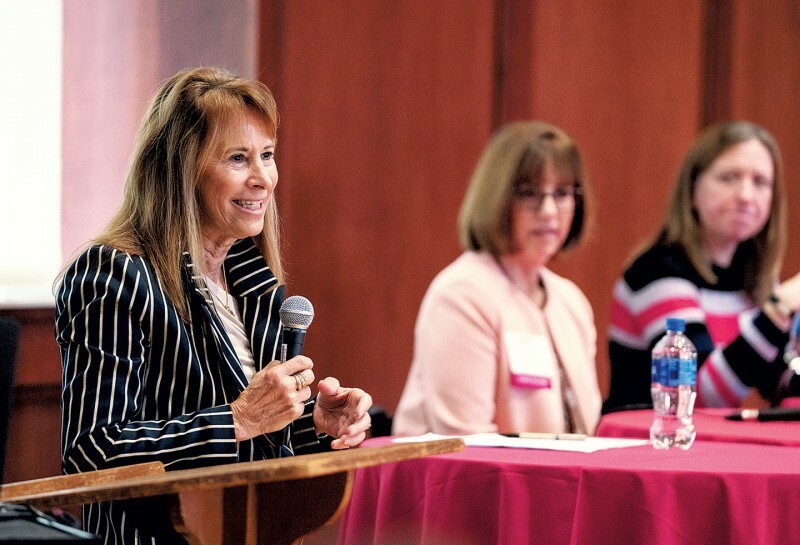 Few universities benefit from a board with the stature, leadership, accomplishment, and deep commitment that is reflected in the OWU Board of Trustees. The board’s responsibility is both to oversee the current strategic focus of the University and to take the long view – to ask hard questions about strategic direction that have implications for 25 to 50 years from now. Board meetings include opportunities for thoughtful engagement with key strategic priorities as well as the ongoing responsibilities for financial oversight, facilities planning, and work with the president. If you were to ask our trustees what they enjoy most about board meetings, they would talk about their interactions with Ohio Wesleyan people – fellow trustees, faculty and administrators, and most importantly, with students. OWU people are smart and interesting, and our trustees appreciate their interactions with one another and with the campus. They never forget that our mission as a residential liberal arts university focuses on the transformational educational experiences of our students. Each board meeting includes a dinner for trustees to spend time with one another in a social setting. The dinner this fall, originally planned for the lawn at Pritchard House, was moved to the Milligan Hub in Stuyvesant Hall due to weather. During dinner the board received a visit from OWU’s new marching band. The music was fabulous, and Mary Kate McNally, director of the Marching Bishops, energized the board with her introduction to the band, which was last seen at OWU in 1961. The return of the marching band is one of the many new programs created as part of the 2020 initiative designed to enhance enrollment at a time of unprecedented challenge in American higher education. The 2020 initiative grew out of a faculty summit on the future of Ohio Wesleyan in May 2015 and a board retreat in February 2016. Since that time, the faculty have adopted 10 new majors, the University has added two new sports and marching band, and we have invested heavily in programs designed to increase retention. Fourteen percent of this year’s new students listed a new major as their area of interest. Twenty-four new students were recruited by wrestling and rowing, our new athletic programs, with another 24 new students participating in marching band (see story Page 18).This year’s class is the strongest class, academically, in nearly a decade, with average SAT scores 35 points higher than last year. The 2020 investments are having significant impact. I am grateful for the visionary leadership of our board, our faculty, and all who have provided generous philanthropic support to advance these initiatives, some of which are featured in this issue of the magazine. Thank you for your generous and passionate support for Ohio Wesleyan.